Z(1)SS, always striving for excellence! Zainab (1) Secondary School, formerly known as Government Girls English School, was set up on the 19th of December 1937. The school was situated in Jalan Merbau, using British Resident's houses as its school buildings. During the earlier years, the school catered only for royalty and nobles. Therefore, one had to be rich and famous to enable her to be accepted to this school. After the world war II, GGES changed its name to Zainab School, after Her Royal Highness Raja Perempuan Kelantan. Another historical event took place on the 8th of January 1957. On this date Zainab School moved from its original site at Jalan Merbau to its present site at Jalan Telipot. And for more than thirty years, Zainab School , one of the primer schools in Kelantan has created its fame in producing only excellence. 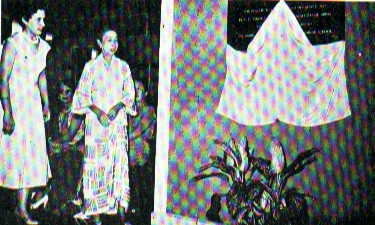 Her Highness the Raja Perempuan accompanied by the headmistress, Miss Hale, unveiling the plague commemorating the Opening of the school. Zainab Girls School, Jalan Merbau. Zainab Girls School, Jalan Telipot. The Government Girl's English School (GGES) was established.It was the second English school in Kelantan after Sultan Ismail College which was founded on 5th Jan 1936.It was located in Jalan Merbau near at the old palace. The school was forced to close due to 2nd world war. GGES had 6 classes and total enrolment of 259 students. Zainab School moved to new building which was almost completed at Jalan Telipot (the present location) equipped with 19 classrooms ,one science laboratory, home science room, library, staff rooms and administration office. The Zainab School was officially opened by DYMM Al-Sultan and Raja Perempuan Kelantan. A school hostel was built next to the school which could accommodate 120 students . Zainab Girls School was divided into Zainab Secondary School and Zainab Primary School. From then on, more classrooms were built. Additional 2 science labs came up. New hostel block was built to cater for increase number of students living far away. 2 double-storey blocks of building consisting classrooms,labs and homescience rooms were built beside the school hall. Additional 2 blocks double-storey blocks of classrooms were completed. 3 storey building comprising 12 classrooms was completed. Construction of new science laboratories block and 2 blocks of classrooms and staff rooms started in July 1999. Also the construction of the new sheds and workshop.